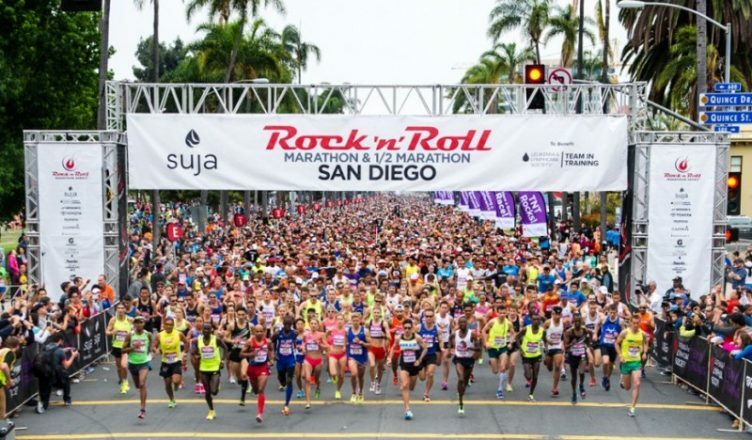 The San Diego Rock ‘n’ Roll Marathon was placed on hold on Sunday afternoon after shots were fired near the route. The shots came from near a parking garage in downtown, and a woman in her 50s holding an airsoft gun was subsequently arrested. According to the San Diego Police Department, a police officer was rushed to the hospital after wounding himself from an accidental self-inflicted gunshot to the leg. Tens of thousands of runners were participating in the race at the time, with thousands of additional spectators. The first reports of gunshots were made from the City Hall Parkade about two miles from the marathon’s finish line. Coming over the wire at 11:20 a.m., the first reports were shortly followed by officials shutting down the marathon’s path at 11:45 a.m. and relocating around 5,000 runners to a safer area. Officers had been posted throughout the race previously to offer security and regulate traffic, so units were already in the area to respond. In a press conference conducted by Chief of Police David Nisleit, the alleged shooter “pointed a gun at one of the officers” after several officers located the woman inside the parking garage. One officer fired twice at the woman, Nisleit noted. However, both shots missed, and the suspect continued to move higher up the garage. Eyewitnesses at the scene reported to police that the woman’s gun was very visible, and some believed her intention was to shoot at the athletes. “During that time the person was armed with a handgun, had the handgun very visible, the helicopter could see the handgun, so we started getting calls in of an active shooter,” Nisleit said, according to NBC7. Although the police department must review the body-camera footage from the incident and interview the responding officers before making a final conclusion, they will be looking into the claims that the woman was targeting the runners. Nisleit also announced that the shooting incident is believed to have been in connection with a kidnapping reported in Chula Vista this morning by a man alleging that he was gagged, tied, and kidnapped by a woman. Police concluded that his description matched that from another report of a hit-and-run downtown at 10:45 a.m. The crash occurred at the intersection of Kettner Boulevard and West A Street, and the woman allegedly drove her car into Civic Center Plaza Parkade, where the standoff with police took place. The race resumed at around noon, and the officer shot in the leg is expected to make a full recovery.